The Single bets category is orientated totally towards the bet and the tip for one match. After a careful and detailed research our tipsters choose and analyze the forthcoming games, taking into consideration all the factors that could be essential for the result of the match. The Accumulator Tips category in Prosoccerbets gives you the opportunity to win from bets with odds 3 to 5. The matches you’ll be offered will be 3 to 5 and each one can have a different type of betting (1×2,Double Chance,Half Time/Full Time,Over/Under,Asian Handicap). Bet of the day is a section in which you get a tip for a single game. This match could be chosen from all popular European championships, as well as from more exotic countries. From all matches of the day our tipsters sort out just one with a bet between 1.70 and 3.00. Soccer prediction for 22.04.2019 are ready ,you can buy it from pay pal buttons at the bottom of the site or at the price page. Our football predictions are already prepared, the soccer tips will be send on you e-mail after your payment. Our professional football tips are: *We offer three Single football betting picks. 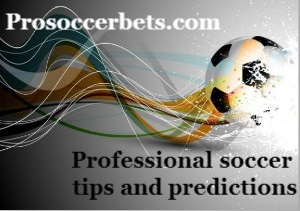 Soccer prediction for 21.04.2019 are ready ,you can buy it from pay pal buttons at the bottom of the site or at the price page. Our football predictions are already prepared, the soccer tips will be send on you e-mail after your payment. Our professional football tips are: *We offer three Single football betting picks.